Various studies suggest that more than 80% of those who accumulate funds in 401(k) accounts remove them from the plans within the first few years after retirement. In most cases, employees who roll their funds out of their 401(k) plans do so because they want the greater freedom and flexibility that comes from working with their own advisors. Through their advisors, they can select from an unlimited range of investments perfectly suited for their specific income, capital preservation and growth needs in retirement. Prior to retirement, the 401(k) and similar employer-based plans are the single-most efficient way to put money away for retirement. Pensions aren’t there anymore. Only 7% of private-sector workers rely solely on traditional defined-benefit pensions, according to the Employee Benefit Research Institute. That’s down from 62% 30 years ago. In contrast, participation in 401(k)s – which focus responsibility on individuals to save for themselves – has risen to 67%, more than four times the rate in 1979. In other words, what most people are going to have in their retirement is what they’re going to be able to accumulate – and Social Security. In an earlier article, Kyle Tetting examined the options of rolling over retirement plans. The 401(k) gives you the opportunity to save for retirement painlessly because your contributions come directly out of your paycheck – you never touch the funds you put away. And you get a tax deduction, so the government is subsidizing your retirement savings. Also, some employers match your contributions up to a certain level. Take advantage of that, but don’t stop there. Put in as much as you can afford without negatively impacting your standard of living. The earlier you start, the better, because theoretically the more the money should grow. The question early on is how you should invest the money in your 401(k). That gets into the fundamental questions of asset allocation. If you have an investment advisor who’s managing other parts of your money, definitely talk with that person about how you should allocate your 401(k) contributions. The younger you are, the more risk you should be willing to take. I’m generally going to recommend being pretty cautious, however, even when you’re younger so you don’t lose too much due to market meanderings. I like a balanced approach – half stocks, half bonds – for most people most of the time. The older you get, the more cautious you should be. Especially as you approach retirement a few years down the road, make sure that you’re well-balanced because you may have to start digging into that money for your daily living expenses. 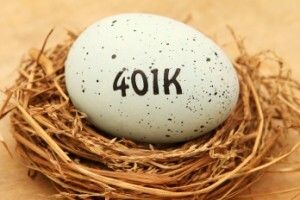 My general view is that retirees can benefit significantly from rolling money out of their 401(k) accounts. Sure, some people choose to leave their money with their former employers, but for most, this is not the preferred or most beneficial alternative. One excuse for leaving money with your former employer is that you may have good investment choices. You might even be able to benefit from lower expenses because the company gets a discount. More often than not, though, your plan options are limited even if the expenses are lower. Although some individuals do have the knowledge, discipline and time to manage their retirement nest egg successfully, most don’t. Most investors can benefit from the assistance of qualified professional advisors experienced at helping individuals make the most important financial decisions of their lives. After decades of working and saving for their golden years, retirees need their money to work for them. They owe it to themselves to find the best resources available to put their precious assets to work. Please click here to see the Internal Revenue Service contribution limits for retirement accounts.